I talked to my bee supplier today Ray Olivarez. He was talking Saskatraz queens. He says he has Saskatraz queens in about half of his operation of 16,000 colonies. He has been really pleased with how the queens have worked. Saskatraz queens when they were being developed, part of the criteria was being sustainable. Sustainable meaning they are better dealing with mites, honey production and winter survival. What Ray has found that his bees have been much healthier. Being that the bees are in the Almond groves of California, fungicides are widely used to protect the blossoms of the Almond tree. Honeybees have been getting injured by the fungicides. Ray has noticed that the Saskatraz have been able to handle the fungicides much better. Ray also feels, in his opinion, that the Saskatraz queens seem to be better dealing with Deformed wing virus. Olivarez Honey Bees is the exclusive producer of Saskatraz Queens in the U.S.
Ray says the orders for Saskatraz queens have been through the roof, over 70% of his orders for packages and queens are for Saskatraz. Some queen producers are trying to raise Saskatraz off production queens. The resulting quality do not have all the vigor and vitality of a true Saskatraz Breeder Queen from Saskatchewan. Any beekeeper purchasing these queens, are not getting true Saskatraz queens and are getting a queen that does not have the attributes of the real deal. Nature's Nectar LLC is pleased to be the only seller of true Saskatraz queens in the state of Minnesota. We have noticed the Saskatraz are outselling Carniolans and Italians. This is the hottest selling queen around the country right now. We are getting more beekeepers who used to by their bees elsewhere buying from Nature's Nectar LLC, they see the value of purchasing Saskatraz queens. They realize, spending a little more, for a better queen, is worth it. After the big dump of snow and the bone chilling cold of a short time ago. Beekeepers are looking forward to be able to dig in their hives. While beekeepers need to be patient for the short term. Spring is coming. I was out shoveling today. The bright sunny day after all that snow. It was quite beautiful with all the snow still hanging on the tree branches and the fresh new undisturbed snow. The glare of the sun off the snow, being hard on the eyes. But the sunny winter day brought out the chickadees mating call. Fee-Bee Fee-Bee. Finally a sign of spring. Also right now Great Horned Owls will be nesting now. Sometimes early in the morning before it gets light, I can hear the Owls hooting. Take some time in these next few warm sunny days, stop and smell the roses. Listen for the chickadees. If you live in a rural wooded area, walk outside before it gets light and listen for the owls. If you experienced a big snow dump at your place like I did. 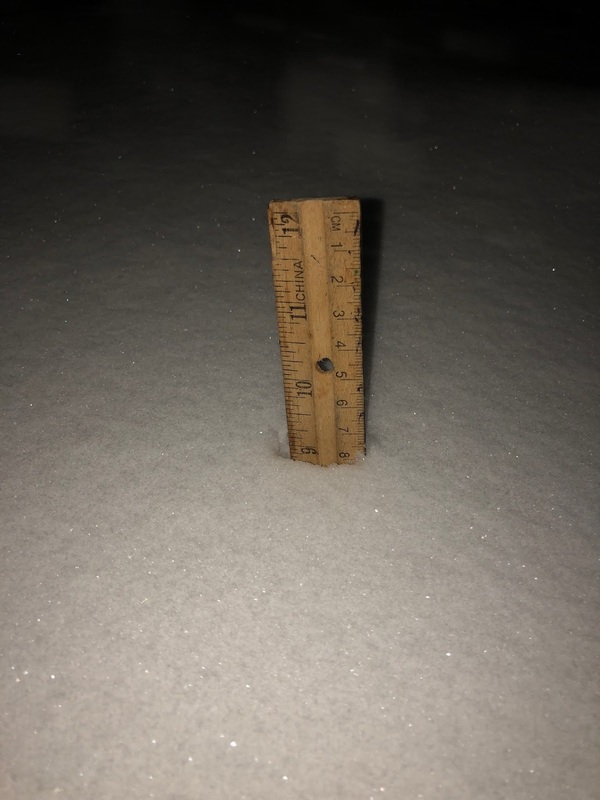 About 9 inches at 6 pm with more coming. If the hives get buried with snow, it is usually not a problem. The snow will add some insulation to the hives. It doesn't look like big cold after this storm as would be normal after a January snow storm. Warm weather will be following the snow. With the black covers and warm sunny days expected, the snow will melt quickly from around the hives. This class is a year in beekeeping. Taught by Mike Mackiewicz. Mike is an experienced beekeeper. He has kept bees for many years. His class covers a wide variety of subjects that every beekeeper can use. More info: A year in the life of bees. A year in the life of bees click this link for more info. Sunday, January 28, 2018; 1:00-4:00 p.m. This is a beekeeping class for the curious! Come find out why there’s so much buzz about bees everywhere and determine if beekeeping might be in your future. This is not a comprehensive class for new beekeepers, but it will definitely get you headed in the right direction. We’ll discuss basic bee biology and ecology, beekeeping tools and equipment, the costs associated with beekeeping, and bee resources available in the Twin Cities. Plus, honey tasting will be part of our sweet afternoon snack! Netflix has a good documentary series called Rotton. The first episode is about honeybees. They talk about struggles of a beekeeper, adulterated honey and how it happened and the theft of several thousand beehives over four years. This video I made a few years ago. The pics were from Jerry Linsers hive. He demonstrates one way to look at a hive on a cold morning. On a cold Jan 29th day. The bees were still peeking out the top hole of the top box. It will be warm for the next couple of days. This is good timing after our long cold spell. With the warmer weather the bees can move their cluster easily and hopefully re-position slightly on a fresh frame of honey. This will prep them for the next cold blast later this week. There should be no brood in a colony right now. Bees will be going on cleansing flights over the next few days. It is a good time to see if your hive(s) are alive. There will be bees dying in the snow. This is normal. If you don't see bees on cleansing flights, it doesn't mean that the hive is dead. If a colony was very heavy with honey especially a three deep hive. The bees could still be down deep in the box and can't break cluster to get out. You can rap on the side of the hive and listen for a buzz. If you get physical with the hive, a beesuit may be in order. An interloper could fly out and give you some payback for the disturbance. Not seeing cleansing flights today is not a huge problem at the moment. As time goes on, the cluster will shift into the top box and cleansing flights will be more frequent with the warmer February weather. Here is our 2018 package bee pricing. Only thing different than last year is we will be offering Saskatraz Queens with our 2 lb and 3 lb packages. There is a $2.00 Royalty fee on all Saskatraz packages. This Royalty fee is paid to the developer of the Saskatraz line of queens. Also, the large quantity pricing has gone down. Queen types. Click on the queen type and scroll down for description.